I haven't seen this in the thread, but what are your TOS for using this script in commercial projects? Or do you have general TOS for commercial projects with all of your scripts? Generally, I am fine with people using my scripts in commercial projects, as long as I get a free copy of the game when it's finished. Great! I have a friend who's going to be branching into commercial projects with Ace, and I'm just about to recommend your scripts. I'll make sure you get a copy of his game when he's done developing. I love your script, but I can not make it work I speak French. I can not do a quest! how do i make a quest for hunting a certain amount of monsters? You do it with events, not through this script. This script just graphically represents that quest. q[:name] = "Animal Trouble in Lynis"
q[:description] = "Wolves are attacking the town of Lynis. The mayor has put a bounty on their heads." q[:objectives] = "Speak to Mayor Trakia." q[:objectives] = "Kill 5 Wolves. \\v / 5"
q[:objectives] = "Return their pelts to Mayor Trakia." 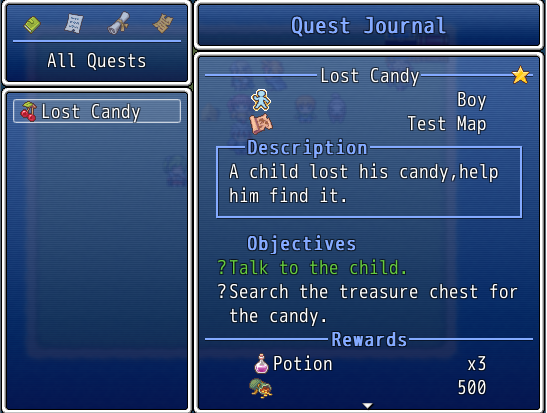 As a sample, you would then set up the actual quest through events. In this example, I am using the pelt count as a proxy for wolves killed, meaning every wolf would need to have a 100% drop rate for pelts. However, that is not totally necessary. You could do it simply by kills, but you would need to set up counting events in every troop that has wolves (if you are doing random encounters). If you are not doing random encounters, you would just need to count the wolves in the troop inside the event in which the battle is called. Anyway, the following event does it by pelt count. @>Text: Hey, you might not want to go to Lynis. I hear there are wolves attacking that town every night! 7 is the quest ID I chose at the very top of the event I setup - "when 7". It has to be unique so that you can identify it when you are modifying objective status. That reveals the "Talk to Mayor Trakia" objective. @>Text: Please help us! We are being attacked by wolves! I will give you 500 Gold if you kill five of them. @>Show Choices: OK!, No thanks! @>Text: Oh thank you so much! Bring me five pelts for your reward. @> quest(7).objectives = "Kill 5 Wolves 5/5"
@>Text: Please return when you have killed the savage beasts! @>Text: Thank you for your earlier assistance. Switch 34 and Variable 4 were randomly chosen IDs. Again they can be any ID, as long as you are consistent. I chose variable 4 actually when setting up the quest, as I set that to be the pelt count. That's all very messy, but I am sure you can adapt it to your needs. First off, thankyou modern algebra for these wonderful scripts. I'm a total newbie with RPG Maker, first time using scripts, first time everything. I decided to try out your quest script. This may be dumb but how do you move the quests to "completed" after the objectives are met? I've placed objective_complete? (ID, 0,1,2 etc) in my conditional branch to get my rewards but the quest didn't move to complete. Also, is this script really customizable in terms of changing graphics? I've put a picture in the banner section and it was real neat. Wonder if you can customize other parts. Thankyou so much for inspiring me and I hope to learn a lot from you. With respect to your first question, the code you chose only checks whether the specified objectives are complete. There are two ways to complete a script. Firstly, a quest completes when all prime objectives are completed. Which objectives are prime depends on the value of q[:prime_objectives] when you setup the quest. If you do not include it altogether, then all objectives are prime. If it is [x, y, z], then only objectives x, y, and z are prime. Where x, y, and z are the objectives you want to complete. Once all the prime objectives are completed in this manner, then the quest status changes to complete. If any one of the prime objectives are failed, then the quest status changes to failed. In all of the above code samples, ID should be replaced with the integer ID of the quest you are modifying and x, y, and z with the IDs of the objectives of which you are changing the status. In description and the objectives, you can use any message codes like \\v[n], \\c[n], etc. You can change the quest level to show either as a number of a generic icon corresponding to the level (ie. 1 stars for level 1, 2 stars for level 2, etc...), as one unique icon for each level (ie. 1 bronze star for level 1, 1 silver star for level 2, etc...), or as a label (like "Rank:") followed by a number or letter corresponding to the level (you can set which letters correspond to which level). There might be more that I am forgetting. "Script 'Quest Journal' line 1583: TypeError occurred. can't convert true into Integer"
it worked fine until I tried to make the journal accessible from the menu. Never mind, it was an error on my part. So far I like the script, MA! Yeah well,I am loving this,but what's up with this!? What's up with those question marks? It looks like your system isn't rendering the diamonds in the font properly for some reason. to a character your font recognizes. Just wondering, unless I overlooked it, how would I mask rewards? The 0 in the string array is just the index of any icon you want to show. 0 is no icon, but you could change that to some other icon. Where x is the ID of the quest you setup. I use since array indices start at zero, so its ID is 1 since it is the reward after the gold. In that particular case, it is changed to give Weapon 12. Alright, thats what i was looking for! Thanks. But would this work to add a reward? Say I did not want the player knowing how many rewards they would get? Would I just leave blank strings? You could just leave blank strings, or you could just push the new entries to the array. Ie: you could have the above example and it would show just the two rewards in the Quest scene. and then the quest would show three awards: the gold, Weapon 12, and now 2 of item 1. Thank you! You are a godsend! But, How can I enable the Quests scene? Just reveal any objective of any quest. It is disabled until there is something in the journal to see. Page created in 1.457 seconds with 25 queries.